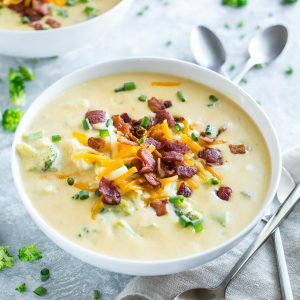 This Cheesy Broccoli Potato Chowder is crazy delicious. Say hello to my new favorite soup! 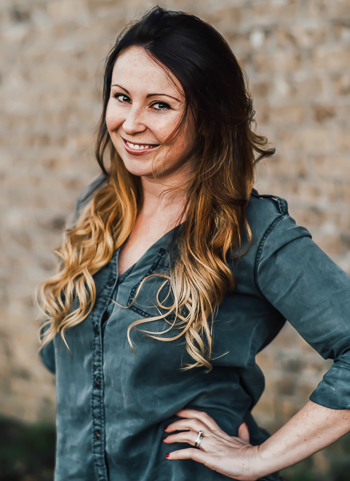 Every so often I’ll create a recipe that completely takes over my blog. I have a feeling this might be one of those recipes. And if I’m totally jinxing myself here then so be it; that means more soup for me!!! Just a few bites into this lusciously loaded broccoli cheese soup and I was completely head over heels in love. I immediately had to take photos because, hello, #foodblogger so I gave Paul the teeniest little sample bowl of soup and threw myself into the studio to snap some shots of the final product. I’m pretty sure I took an hour’s worth of photos and I’m 100% certain I tortured the pants off my poor husband by not allowing him to have another bite until I had finished. I probably would’ve been in agony too had I not the self-preservation to reward myself with spoonfuls of soup for a job well done. Guys I thought we talked about these hashtags!!! Stop letting me get away with this nonsense. On to the recipe! I think it goes without saying that this deliciousness is already on the menu again for next week! This rockin’ recipe yields 8 cups or 4 larger bowls of soup. Whether it’s served up as a side dish with a salad or grilled cheese/panini or the main course stealing the show, this soup is sure to reach bowl-licking status with your friends and family. 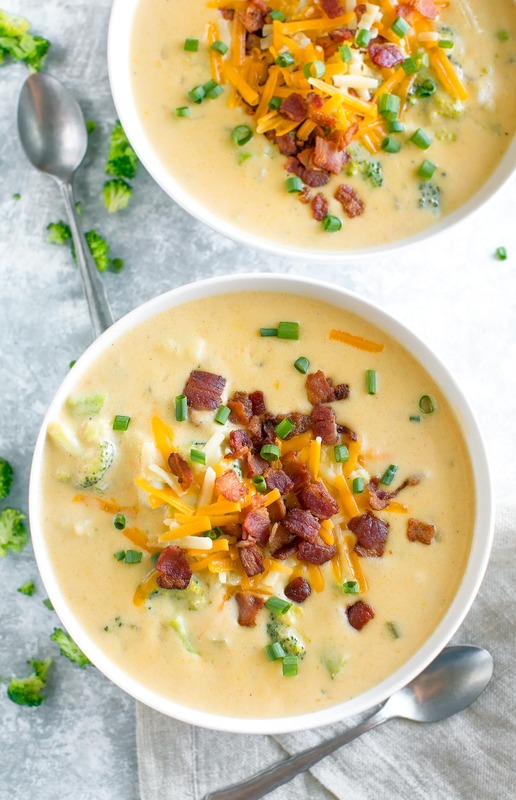 Recipe yields 8 cups of soup or 4 bowl-sized servings of this cheesy broccoli potato chowder. The leftovers reheat like a dream so feel free to squirrel some away for the next day! Chop your veggies and measure out your ingredients. Steam or blanch your broccoli until tender and set aside. For the potatoes, peel and dice into cubes. In a large pot or dutch oven, melt 1 TBSP butter over medium-high heat. Add your chopped onion and celery and cook until tender. Reduce heat to medium and add remaining butter and garlic, sautéing briefly until fragrant. Add flour and stir into onions. Continue to stir, allowing the raw flour to cook off for 20-30 seconds or so. Add your broth, milk, and potatoes. To prevent sticking, stir constantly as the soup bubbles and thickens. Season with salt, pepper, paprika and optional nutmeg allspice. I added 1/8 tsp of each but if you're not a nutmeg fan, totally skip it! Reduce heat to low (I set mine to 2), cover, and simmer for 10-15 minutes until potatoes are tender. Remove from heat and stir in your broccoli and grated cheeses until melted. At the end I stirred in 1/2 cup of heavy cream (I couldn't help it - so good!) so feel free to follow suit if you'd like! The soup is fantastic with or without. Sometimes I'll even break up some of the potato with a spatula to make the soup even thicker! Ladle soup into bowls and top with all your favorite toppings. Enjoy! Depending on preference or availability, you can use either vegetable broth or chicken broth for this tasty recipe. If using regular sodium broth vs low sodium, simply skip adding the salt until the end and season to taste. Gluten-Free? Use your favorite GF flour blend in place of conventional flour for the roux, or skip the flour entirely if you don't mind the soup being less thick and more soupy. Both work! I used my handy dandy dutch oven to make this cheesy broccoli potato chowder but a plain pot works great too! Since I know y’all are going to ask, I’ll be sure to do a slow cooker test run with the next batch and update this post with the instructions if it goes great! Only have (or prefer to use) chicken broth? It totally works in place of the veggie broth here! Some of my friends are rather opinionated about nutmeg. If you’re not a fan typically feel free to skip it! Ground allspice can be used in its place if you’d prefer to swap vs. skip. Vegetarian? Fabulous! Skip the optional bacon topping or snag some vegetarian bacon bits and you’re good to go. Gluten-Free? I’ve used my favorite all-purpose GF flour (King Arthur is my jam!) in place of the conventional flour and it works great for the roux that thickens the soup! Feel free to follow suit. 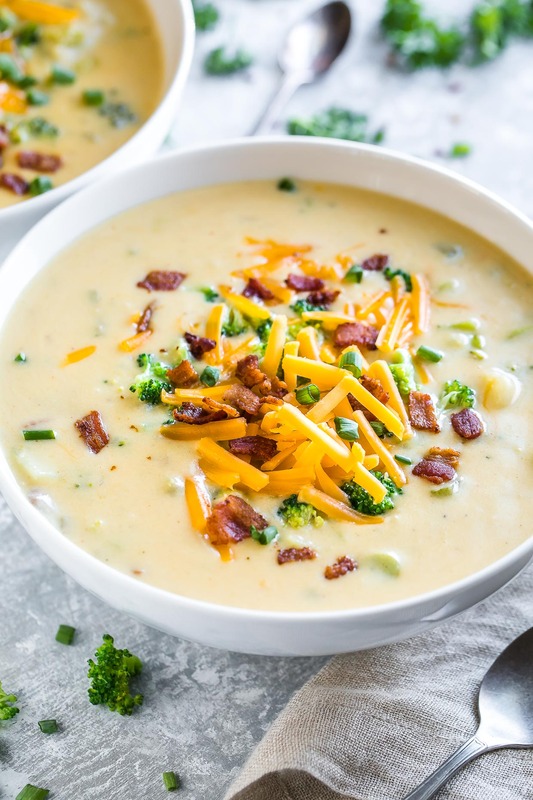 Broccoli and Cheese Soup <– the inspiration for today’s recipe! 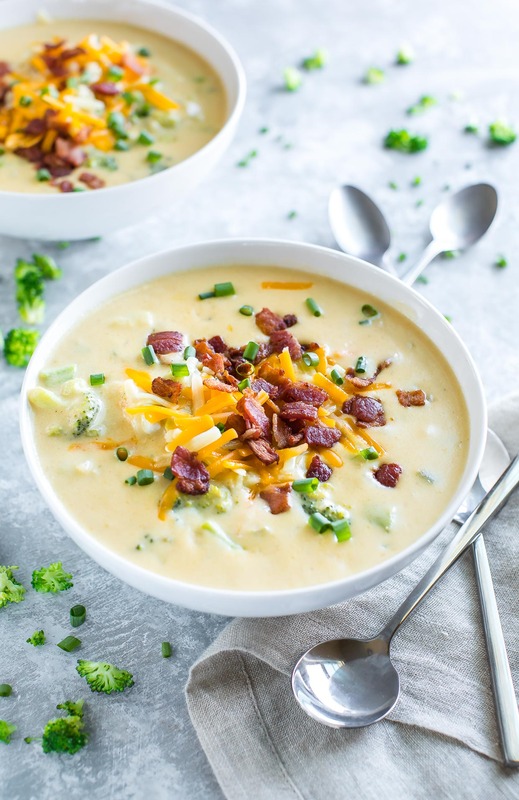 If you get a chance to try this easy Cheesy Broccoli Potato Chowder, let me know! Leave some love in the comment form below or tag your photos with @peasandcrayons on Instagram so I can happy dance over your creation. Just made this soup! It is awesome! I didn’t have milk so I used a can of evaporated milk watered down drastically and turned out great! Oh my…wow. Right up there with chocolate. This soup looks amazing! Pinning for later! I could legit eat it forever! Thanks Karly! I want to bathe in this soup. Also I love the new layout and header. Super snazzy dah’ling. Doooo it! Thank you dear! Hope you get a big bowl of this delicious soup in your face, STAT!